History comes alive as the group travels across Europe--from the romantic sights of Paris to the bleak battlefields of Belgium to the Austrian labor camp these men liberated so many years before--and Ava sees a side of her grandfather she's never known before. As he shares his memories of those bitter days on the battlefield, she begins to understand how his experiences in the war made him the man he is today. Throughout the journey, Ava and Dennis are drawn together in ways neither of them expected. Can their memories of the past lead to a bright new future? I was pleasantly surprised at how much I enjoyed this book. I say that because I haven't completely enjoyed Tricia Goyer's books in the past, but the topic of World War 2 is one that fascinates me and I was game to give Tricia another chance. I'm so glad I did. Ava loves her job as a television producer, but a broken engagement has wreaked havoc with her life and purpose. When her mother asks that Ava accompany her beloved grandfather on a trip to Europe to revisit areas that he was instrumental in liberating during the war, she can't refuse. Once in Europe, and after meeting her grandfather's best friend, Ava discovers that her first love, Dennis, is also accompanying his grandfather. Excited at the chance to document the trip and use the footage to boost her show's ratings, Ava steps on a lot of toes before she learns her lesson about what is truly important in life and relationships. I enjoyed the historical aspect of the novel and the reminiscing that the two grandfathers share. And, although a bit prickly to begin with, Ava grew on me and I enjoyed discovering what would happen with her relationship with Dennis. Tricia includes an extensive author's note where she documents and shares her research and information. First-hand interviews with WW2 veterans are the best way to learn about what really happened in the trenches and front lines of Germany, France and Belgium. An enthralling, enjoyable historical read and one I easily recommend. Thanks to Christen at Litfuse Publicity for the opportunity to review this book. You can learn more about Tricia Goyer here. You can purchase your own copy here . You can see other reviews and tour stops here. 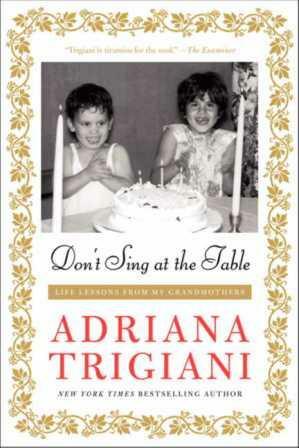 Don't Sing at the Table: Life Lessons from My Grandmothers...Giveaway Winner! Eli and Priscilla want to be missionaries. He wants to go to the frontiers of Oregon and she to India. When the missionary board rejects their applications, they reluctantly marry in order to serve and Priscilla agrees to give up her quest for India and travel to Oregon with Eli. I will admit to finding the premise a bit implausible: that this man and woman who barely knew each other, would marry for convenience simply so they could be missionaries. But, the story was compelling and quickly drew me in. Priscilla and Eli were characters I grew to care about. Their travels from New York to Oregon by wagon train were difficult and arduous, but very true to life. Yet, as they journey, faith in God and a growing love and faith in each other shows them that anything is possible. I enjoyed reading their story and seeing the growth in themselves and their relationship. I also enjoyed the author's note that shared the true life inspiration for the novel. 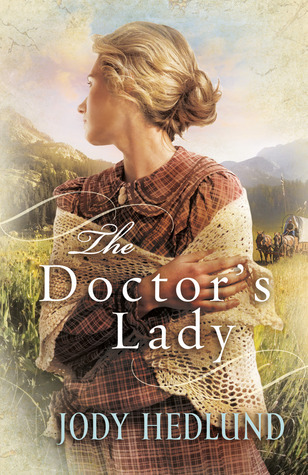 I liked, but didn't love Jody's first novel, The Preacher's Bride, but I thoroughly enjoyed The Doctor's Lady. Rick Denton is a fairly selfish man. He's pulled away from his family and from God. When his step-father suffers an aneurysm and his mother asks him to come home to tend their little bookstore, Rick is unenthusiastic and more than a bit resentful. Yet, he comes and he finds himself drawn to Andrea, the other store employee and her young daughter. And, as he comes to know his mother and step-father again, he begins to see not only them, but mostly himself, in a very different light. 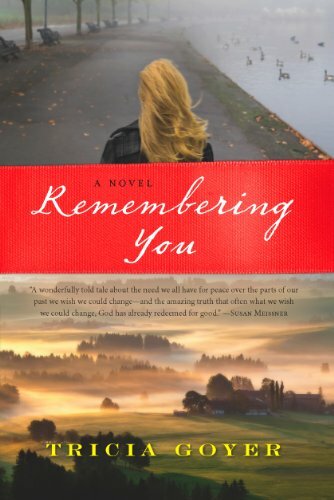 As he discovers secrets from his past and learns answers to questions he wasn't sure he had, Rick discovers that God does know who he is and what he needs in his life. Christmas is magic and it's often a time when hearts soften and forgiveness is given. People are more likely to be in a giving mood and when you give, you receive so much more in return and I think you're more susceptible to true reason for the Christmas season, that of celebrating the birth of our Savior, Jesus Christ. 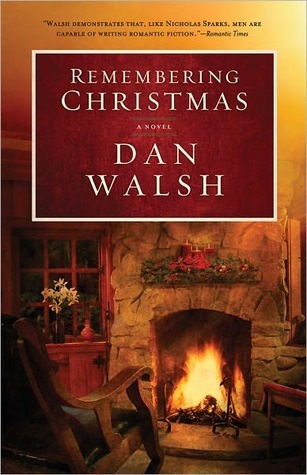 Dan Walsh is a terrific storyteller and he's captured that magic and written a warm, captivating, comfortable Christmas novel. I love Christmas. I love Christmas stories and collect them, so I'm always excited to find new ones each year. Remembering Christmas is one that I will gladly add to my ever growing collection. 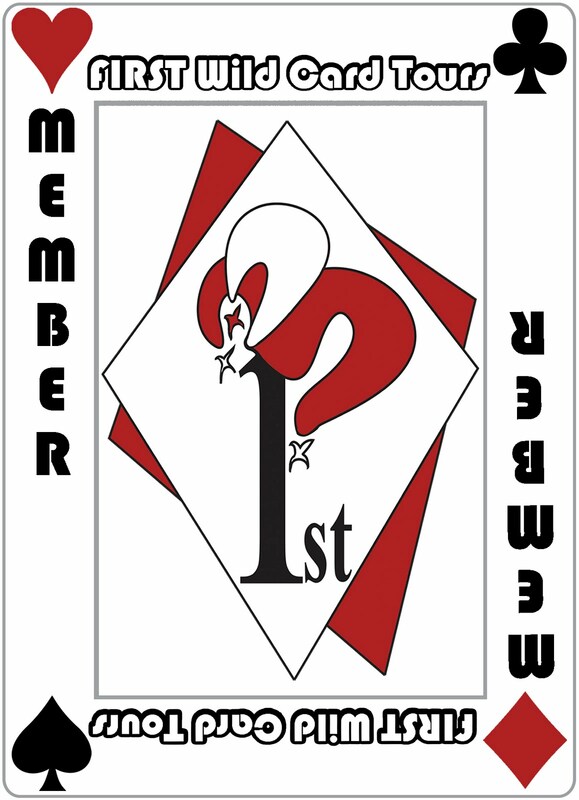 Available September 2011 at your favorite bookseller from Revell, a division of Baker Publishing Group. Thanks to Donna Hausler of Baker Publishing Group for the opportunity to review this book. You can learn more about Dan Walsh here. You can purchase your own copy here . "God has never left us down here"
Thirty–three miners – trapped beneath the Chilean desert. _their situation, at first, seemed hopeless. 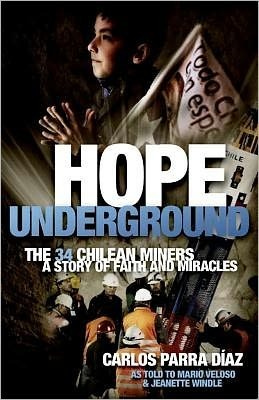 Yet instead of abandoning hope, the miners, their families, communities of faith, the Chilean government and rescue workers united in an effort to achieve the impossible. What drove these people to defy failure and persevere against all odds? How did a small, white butterfly, a wayward probe, and a '34th miner' all play a significant role in the unfolding of this incredible story? While most reports of this stirring drama focus on what human effort can achieve, Hope Underground reveals the spiritual nature of the miners' experience, highlighting amazing details of how God's providence turned a potential tragedy into the most successful mining rescue of all time. I don't think there are many people who didn't follow the saga of the miners trapped in a Chilean mine, and there are even fewer who didn't watch their miraculous rescue. But, what happened to them while they were in the mine, and what happened to their families and the community who held a vigil outside the mine entrance? Carlos Parra Diaz, a pastor who became the Chaplain of Camp Hope, shares his story of what happened. Pastor Diaz went to the mine to help the people, to pray for them. He soon found himself in the unofficial position of camp chaplain. He came to know the families of the miners and the politicians who came and went from Camp Hope. Once communication with the miners was established, Pastor Diaz was instrumental in sending 33 tiny Bibles down to the miners, to help sustain their faith. There were some language and sentence structure issues that were simply due to differences in translation and were fairly easy to overlook. The book is a terrific account of an amazing 10 weeks. The Camp Hope community was a community in every sense of the word. People who came together during a crisis to sustain and help one another. Truly amazing. Pastor Diaz shares a straight-forward, honest narrative, and shows us that God is indeed aware of His children and hears our prayers. Thanks to Audra Jennings of the B&B Media Group for the opportunity to review this book. You can learn more about Carlos Parra Diaz here. You can purchase your own copy here . A talented artist, Claire Laurent is forced to work as a copyist who forges famous paintings, when she only desires to paint her own work. When her father's illicit occupation forces her to flee her New Orleans home, she finds herself adrift in post-Civil War Nashville. A chance encounter with Sutton Monroe leads her to a position in the home of the city's most prominent women. Claire adapts to her new role and her new life and as she finds herself falling in love with Sutton, she worries that her past will come between them. I loved the setting: post-Civil War Nashville, the world of art and the Belmont Mansion. Claire's story is both richly elegant and humbly redeeming and Sutton is a dashing, yet very mortal hero. This is a charming, engaging novel and one I was sad to see end. I've read Tamera Alexander before and didn't completely love what I read then. But, A Lasting Impression sounded terrific and the cover was gorgeous. I had to read it simply for that. I'm so pleased that the book lived up to my expectations. It appears to be the first in a series and I look forward to more Belmont Mansion stories. Thanks to Amy at Litfuse Publicity for the opportunity to review this book. You can learn more about Tamera Alexander here. You can purchase your own copy here . You can see other reviews and tour stops here. Three forest trees dream of what they will one day become. One dreams of becoming a royal throne; one of being a ship that can withstand any storm; and one longs to stay in the forest and grow as tall as tall can be. When they are felled, it seems their dreams are over. But as each tree is crafted into a new item - a manger, a fishing boat, and a rugged cross - it becomes clear that through the role they play in one important life their hopes are more than fulfilled. 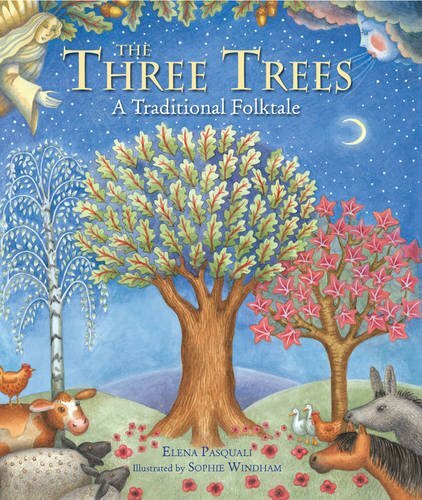 This traditional folktale is accompanied by stylish artwork from a highly sought-after children's book illustrator, and will help set the Christmas and Easter stories into the overall context of the Christian faith. This is one of my favorite stories and one I always read at Christmas. This retelling is illustrated in a rich folk style. While not my most favorite style of art, it's still a gorgeous book. The story is short and concise and perfect to share with any age. I collect Christmas books and we read them all season long. Our family tradition, dating back to when I was a girl, is to read our favorite stories on Christmas Eve. We each choose a story and read it aloud and then we finish with reading the birth of Jesus from the Bible. It's one of my favorite parts of the Christmas season and is the perfect way to usher in Christmas. This little book will go into my collection, to be read each Christmas season. I think it would make a lovely gift as well. Thanks to Kregel Publications for the opportunity to review this book. You can purchase your own copy here . The small town of Parrish Springs is not quite ready for Matilda Honeycutt. A strange woman with scraggly hair and jewelry that jangles as she walks, Matilda keeps busy stocking and arranging her new shop on the town's quaint and lovely Main Street. When rumors start to fly about what might be going on behind the papered-up windows and the locked door, the image-conscious residents start looking for a way to get this woman and her wares out of their town before Christmas. But Matilda Honeycutt has a little something for each one of them sitting on those cluttered shelves, just waiting to be discovered. Last year, I really enjoyed Melody Carlson's Christmas novella, Christmas at Harrington's and so I was excited to see a new one from her this year. The Christmas Shoppe was just as charming. New city manager Susanna Elton is still trying to get her bearings when Matilda Honeycutt shows up and purchases a prime storefront. An angry councilman wanted the building and is determined to see Matilda run out of town. As Susanna and Tommy Thompson, newspaper editor, try to uncover Matilda's secrets, they discover much more than a store full of odds and ends. It's not long before Matilda's magic manages to touch the entire town in one way or another. A charming Christmas novella about finding oneself and purpose in life. With subtle Christian themes of forgiveness and love, this is a sweet Christmas story. It's short and easily read in one or two sittings, perfect for relaxing by the fire. Thanks to Donna Hausler of Baker Publishing for the opportunity to review this book. You can learn more about Melody Carlson here. You can purchase your own copy here . Each day, parents and Church leaders struggle to teach individuals with special needs. Using real-life stories and a touch of humor, this inspiring book guides you to teach effectively, overcome communication barriers, and build strong relationships with people of all ages with disabilities. Discover each person's ability to learn and grow as you help them feel like a valuable part of your life. Having a son who has Asperger's, I was very anxious to read (dis)Abilities and the Gospel. I think this is a long-needed and much welcome resource. 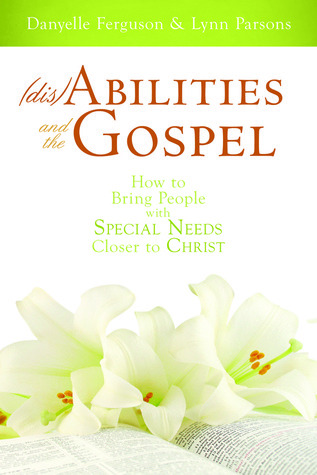 The authors speak from personal experience as each has children with special needs. The book is one you can read straight through, but it's also one that you can pick up and just search or read a chapter. General information about special needs as well as specific information about particular diagnoses is included. I particularly appreciated that there are chapters covering different ages/stages: Primary, Young Men/Young Women/Adults and Families. There are hints and suggestions for both parents and teachers. Suggestions on not only how to survive getting through Sacrament Meeting, but how to teach special needs children about prayer, and about Heavenly Father, scouting, etc. This is a fantastic resource. I think that every ward should have a copy and every auxiliary president as well as any teacher who has a special needs child in their class should read it. While written from an LDS perspective, this is a book that is applicable and adaptable to any denomination or classroom. Thanks to Mariah at Cedar Fort Publishing for the opportunity to review this book. You can learn more about Danyelle Ferguson here and Lynn Parsons here. You can purchase your own copy here . 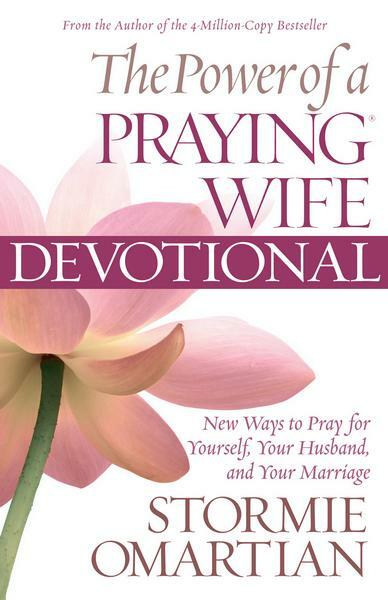 The Power of a Praying Wife...Wildcard!